Belly button piercings are one of the most common body piercings today apart from the ears. Infected belly button piercings can be avoided by cleaning the wound properly, and if you do this, the pierced navel should heal within 6 to 9 months. However, sometimes the belly button can become infected due to bacteria and germs getting into the pierced area. This can cause pain, swelling, redness, discharge, and a bump around the belly button jewelry. If you notice any signs of an infected belly button piercing, it is important to act quickly to treat the infection. Many natural home remedies like tea tree oil, saline solution, and aloe vera can help to kill off the infection-causing bacteria and soothe the inflamed piercing. Because an infected wound can become a serious health condition, you should visit your doctor if the home remedies don’t help to clear the infection in a day or two. This is especially true if the area around the belly button is throbbing, tender, and feels warm to touch. Proper piercing aftercare helps the majority of navel piercings heal without any complications. If you are concerned about an infected belly button piercing, this article will help you identify its symptoms and treat mild infections. You will also find out how to clean a belly button piercing to prevent infections. Each piercing location on the body has its own normal healing time. While the wound is healing, it is important to follow the aftercare piercing instructions you received from the piercer. Infections occur when the wound becomes infected with the Pseudomonas or Staphylococcus strains of bacteria. Many times, you can avoid serious infections around your belly button piercing if you get it done by a professional piercer in a salon that has high standards of hygiene. You should also choose good quality jewelry to prevent allergic reactions to the foreign object. It is completely normal to experience redness, some swelling, itchiness, bruising, and even some bleeding after getting your belly button pierced. Clear or white pus that drains from the piercing is also part of the normal healing process. However, these symptoms should gradually improve over a few weeks if you care properly for your new piercing. The skin around the belly button becomes increasingly red and painful. The area around the navel piercing is swollen. Yellow or greenish pus starts to drain from the navel piercing wound and it gives off an unpleasant odor. You notice red streaks radiating from the belly button. This is a serious condition called lymphangitis and you should seek immediate medical care. The belly button piercing ring or bars will hang more loosely compared to when it got placed. You may notice other signs that the belly button piercing isn’t healing as quickly as it should. For example, the piercing holes become larger, the area is very sensitive to touch, a keloid or bump forms near the pierced area. If you only have an itchy red rash surrounding the piercing, it could be a sign that your skin is allergic to the jewelry in your belly button. In some cases you may develop a bump on your pierced belly button. Dermatologist Dr. Gary W. Cole says that keloids are scar tissue that can form after a piercing and cause a bump to form. It’s not fully understood why some people are more prone to getting piercing bumps. Also, it’s possible that a keloid forms after one piercing, but not another.3 For example, a person may develop a nose piercing bump but not get a keloid after navel piercing. It is important to clean the belly button piercing regularly to prevent any infection. You should do this until the wound is completely healed and there is no more redness, discharge, or swelling around the pierced area. Dissolve 1/4 teaspoon of sea salt in a small glass of warm water that has been boiled. Lay on your back and apply the sea salt rinse to the navel piercing using a clean cloth or cotton ball to help kill off infection-causing germs and soften any discharge from the wound. Hold for 10 minutes to allow the saline solution disinfect the pierced area in your belly button. Gently pat the navel area dry with clean kitchen towels or tissue paper. Repeat the cleaning process 2 times a day to help the piercing heal and kill off any germs in the belly button piercing. Remember: you should never remove the jewelry from the pierced hole when cleaning it or even if you think you have an infection. 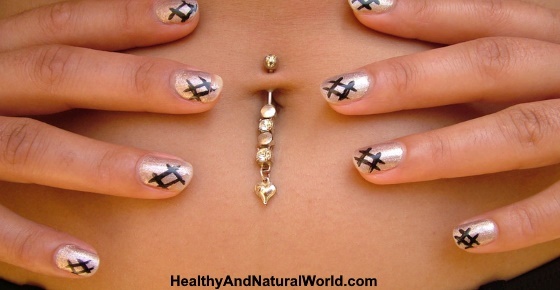 There are also many other home remedies that can help to speed up the healing process of a belly button piercing. These remedies contain natural ingredients that have proven to effectively destroy bacteria that cause skin infections. Tea tree oil can help to remove germs and bacteria from belly button piercings as well as nose piercing. Tea tree oil contains powerful antibacterial and anti-inflammatory properties that make it an effective all-around natural antiseptic for cleaning an infected belly button piercing wound. Use tea tree oil together with coconut oil to make an antibacterial salve for healing belly button piercing wounds. Mix 1 tbsp. coconut oil with 2-3 drops of tea tree oil and apply to the affected skin around your belly button. This will soothe the irritated skin and help to reduce redness and swelling. Apply the salve twice a day until any signs of a mild belly button infection have gone completely. This home remedy should be used in addition to regular cleaning of the pierced area with the saline solution. You can also use the tea tree solution to treat infected daith piercing or tragus piercing. Aloe vera is a great natural remedy for various skin conditions and it can help speed up the healing process of a mildly infected belly button piercing. Apply a small amount of pure aloe vera gel to the infected navel area to speed up the healing process. Repeat the remedy 2-3 times a day to help the piercing heal faster and prevent scarring around the hole. Chamomile is a wonderful soothing herb to help treat skin irritations and infections. You can use a chamomile compress to help heal a belly button piercing infection and clean away and discharge. It is very easy to make a chamomile compress at home. Dip a chamomile tea bag in a cup of hot water and carefully squeeze out excess liquid. Apply the warm compress to your belly button piercing and hold for 5-10 minutes. Repeat applying the chamomile remedy 1-2 times a day to help the navel piercing heal quicker and prevent infections. Diluted raw unprocessed apple cider vinegar can be used as an antibacterial rinse to help reduce signs of infection around the belly button piercing. Mix equal parts of raw apple cider vinegar and water to treat an infected belly button piercing. Using a cotton ball, apply the healing mixture to the affected skin area to help reduce any signs of infection. Repeat the process 2-3 times a day for best results. Calendula is another natural remedy that you can use to treat infected navel piercings. Extracts from the calendula (pot marigold) plant have antibacterial and antiviral properties that help infected wounds to heal quicker. Calendula oil can also help prevent the formation of piercing scars. To use calendula oil to help cure a mildly infected belly button piercing, you should add 2-3 drops of calendula oil to 1 tbsp. coconut oil. Apply the healing ointment 2-3 times a day to the affected navel skin area until any redness, swelling, and discharge has gone completely. Avoid fiddling with your piercings so as not to irritate the pierced site even more. Always wash your hand thoroughly before cleaning the piercing. Don’t take the jewelry out until the piercing hole has completely healed. Avoid swimming in pools, rivers, lakes, and stay out of hot tubs while the belly button piercing is healing. You should always try to wear loose-fitting clothing so as not to catch or irritate the belly button jewelry. If you are concerned that a belly button infection is getting worse and not healing properly, you should contact your doctor as soon as possible. Medicinenet com. Keloids and piercing. NHS.uk. Body piercing – aftercare. Eur J Gen Med. Vol. 5, No. 2, 2008, pp. 104-106. Wounds. Vol. 20, No. 8. 2008 Aug. I had an infection in my piercing and after a week of sea salt soaks, hot compress and a small amount of bactine to clear up bad bacteria.. it was still showing symptoms of an infection. I had my piercing almost 4-5 months at this point and I decided to visit my primary doctor, he gave me an easy 5 day antibiotic for skin infections. Did not bully me to take it out and it was 100% cleared in 4 days. Moral of the story, it’s worth is to just get an antibiotic if it’s showing symptoms for more than a couple days. I remember looking on millions of these sights to the point where I decided it was time to see a doc and that was my only relief! I’m sharing this because I wish someone shared this with me sooner! Every person needs to apply discretion and common sense to his/her specific condition. If home remedies don’t help after a few days and/or symptoms become worse, then obviously the person will need to see a doctor.